Bringing kids outdoors can be a very challenging task for families. Sure, walking around with a small baby in your arms means sharing more snuggles but doing it even within just an hour can already burn your biceps. The struggle even becomes harder as you decide to take on steep trails and rough terrains. The solution? Use a baby backpack carrier. When the trails no longer allow for a stroller, when you would rather want to keep your hands free or when you would rather save your spine and back from injuries, using the best baby carrier is a worthwhile investment to make. A backpack baby carrier comes in two forms: a framed and an unframed one. A framed backpack does a much better job at distributing weight all throughout the body and also offers storage options and a few bells and whistles although they are usually bulkier and more expensive. On the other hand, unframed ones are lighter and cheaper but your kid sits at a much lower level which means that the weight could easily pull you down. They often do not have a lot of options for storage and cover but that’s what you get for opting for a lighter carrier. With so many baby carrier backpacks to choose from, how do you choose one that is right for you and your kid? We’ve come up with a list of baby carrier reviews to help you narrow down your choices and make shopping a little easier for you. 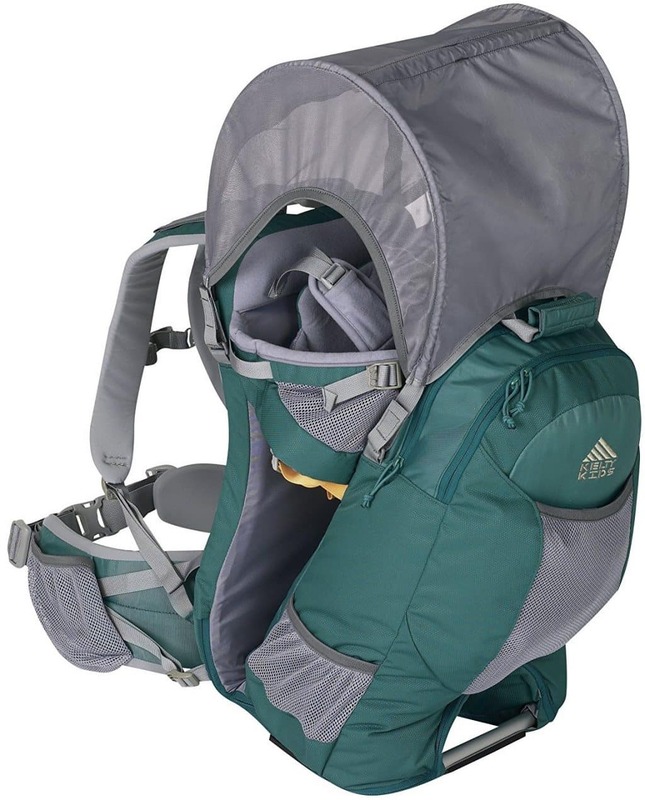 Another option for a baby backpack that will keep you from suffering from back, shoulder and hip pains is the Poco AG Child Carrier from Osprey. AG stands for Anti Gravity which describes their state-of-the-art contoured suspension that helps stabilize the pack so you won’t feel the cargo on your shoulders even if you go on long hikes. There are many things to love about this Osprey child carrier and it all starts with the suspension system. For starters, the design uses aluminum which makes it a rather lightweight carrier. Although the whole tubing frame is made from lightweight aluminum, it remains stable and can carry a load of up to 45 pounds, baby and gears combined. Another reason to love this carrier is that it comes with mesh back panels that wraps and conforms to the body, providing excellent ventilation so you won’t overheat while carrying your baby. You baby will definitely consider this as the best hiking backpack as it comes with awesome features that ensure their comfort and safety. For starters, it has dual grab handles which make it easy to pick up and set down the carrier. The cockpit area is fully framed and padded for safety and it also comes with a removable and washable drool pad to make sleeping comfortable. We also love the storage options for this carrier. The zippered stash pocket allows for small items such as keys, money or a small phone. Meanwhile, the stretch mesh harness pocket allows parents to have a quick access to trail snacks and other baby items. Of course, there is also a removable daypack, built-in sunshade, adjustable and removable stirrups plus an adjustable torso for wearers of different heights and torso lengths. If you have a little more budget to move around, you can also check out the Plus and Premium models. Unfortunately, as much as we love these carriers, we found that their hip belts easily dig in to the skin which makes hiking for long periods slightly uncomfortable. Still, this one deserves to be placed at the top position in our list. When it comes to providing real kid comfort, the Deuter Kid Comfort III certainly lives up to its name. Often referred to as the Cadillac of backpack carriers, this backpack offers quite a lot of features that both parents and kids will surely love. What do we like most about this child carrier? For starters, we love that this one provides among the most comfortable rides for kids. Your little one sits higher behind you which means that they get to see over your shoulders better, perfect for entertaining kiddos on long hikes. It will take a bit of getting used to but the protection that this setup provides is superb. Another thing to commend about these Deuter backpacks is that they make carrying heavy children much easier for parents. The hip belt moves and flexes to adjust to changes so that the actual load does not shift from side to side. Regardless of the types of terrain you encounter, you can be sure that both parent and kid will stay secure and comfortable all throughout. Other smaller details that we like about this carrier are the removable and washable pillow (which makes it comfortable for kids even as they doze off to sleep), the compatibility with a hydration system (making it convenient for moms and dads) and the small mirror that allows parents to make a quick check on their babies behind them. It also allows side entry perfect for older kids and comes with a cute stuffed bear for the little one. But, as much as we love this beautiful backpack carrier, we think that it is a little too heavy and bulkier than we would have liked. At already 7 pounds, putting a baby inside plus gears will make it a very huge and heavy system although it does have a huge storage capacity. Because of this, we will have to place the Deuter pack in the second spot in our list. Yet another premium child carrier we recommend next to the Osprey is this child carrier from Thule. It does belong to the rather expensive price range but it comes with a lot of great features and advantages. What we like most about their toddler backpacks is that they come with a very streamlined, sleek and modern design, much like their regular backpacks. It does not look as bulky as the others yet provides pretty much the same passenger weight and storage capacity. This Thule carrier comes with an adjustable back panel and hipbelt so parents of different heights and torso lengths can take turns using it without any problem. As you can expect from a premium baby backpack, this carrier comes with a load stabilizer. What parents do is to simply pull the straps for on-the-go adjustments. The child is pulled closer to the parent’s body to provide a more comfortable carry. We also love that it comes with a dual load option so your child can get inside from the top or, when they grow older, from the sides. This carrier also allows installation for a hydrating system so you don’t have to reach out at the back for your bottle of water. As for your baby’s needs, you can easily put them in the mesh pockets, removable backpack or in the large zippered compartment. Of course, let us not forget other features such as the sunshade, removable stirrups, zippered hipbelt, mirror and unique kick stand design! But, let’s face it, as awesome as the Thule backpack reviews may be, it still has a few cons on the side. Its price is a major factor that discourages parents, especially those just new in the outdoors lifestyle to make such a hefty investment. Its canopy does not function as well as those of the other brands but still usable. The same thing can also be said for its lower storage compartment and child compartment pillow. For this, we are placing it in the middle of our list. If you are looking for a combination of a stroller, diaper bag and daypack all in one – but with a very lightweight design – check out the Kelty Transit 3.0 Child Carrier. What is great about this Kelty kids carrier? This carrier comes with all the awesome features that you can find in a full-featured child carrier but it is less bulky. Despite that, it can carry up to 40 pounds of weight (baby and gears, combined) but it definitely leaves a much smaller footprint compared to other models and brands. This carrier can even adjust to the growing needs of your child: simply adjust the harness and the height of their seat as they start growing taller. Another thing to love about this Kelty backpack is the sliding torso adjuster. This allows wearers of different heights and torso lengths to use the carrier alternately without any problem. In terms of storage space, this carrier does not disappoint and even offers a bigger capacity compared to the Deuter Kid Comfort II. Its maximum storage capacity is 1300 cubic inches. However, it is still far from being a perfect product. It does come with a hood that helps protect your kiddo against the rain and the sun; no need to buy separately. Sadly, the hood can be a challenge to use and definitely not as good as those of the competitors’ sun shades. Using this carrier might also make you experience some slight discomfort especially when using during longer periods. Since it is not a full-featured carrier, it does not come with load weight adjustment options. If you are very particular about distributing weight all throughout your body, go for a carrier that has load adjuster straps to help bring your load to the center of your back. Still, the Transit carrier is not such a bad choice considering its storage options and its price point. We place this one at the fourth position in our list. For parents looking for a no-frills backpack baby carrier that does its job well without letting you think about too many things, Phil&Teds Escape Baby Carrier is your best option. We are placing this carrier at the bottom of the list not because it is the least in our list but because we think there are still a lot of things to check out about this product and this brand, in general. When it comes to backpack carriers, Phil&Teds does not necessarily come to mind first thing especially if you are not from New Zealand. Still, we think that checking out their products is definitely worth a try. Now, there are many things we like about this carrier. At first glance, it looks very much like the Thule and we really love its sleek, modern look. The entire carrier already comes with the carrier itself plus a sun hood, daypack, changing mat (hooray!!! ), mirror and stirrups. The introduction will probably be enough to convince you to get this one. The foot stirrup is a lot different from the designs that other brands come with and your child’s little feet stays securely and comfortably inside, even through rough terrains. We also love the modern looking removable day pack and the compatibility for a hydration system. Say goodbye to heavy water bottles! As for your kiddo, they can stay safe inside with the adjustable and padded harness supports. Even as they start dozing off, they will not easily be shaken around (while you go and continue your hike) because of the snug shoulder cradle and moldable headrest. Another reason to love this hiking baby carrier, which is also perfect for urban hikes, is its very compact fold making it ideal for traveling. Cool, right? Actually, we think that this carrier deserves to be placed higher up the ranks but we will give it the benefit of the doubt and place it here, at the bottom, for the time being. Still, we highly recommend giving this product a look! Looking for the best backpacks for hiking can be very intimidating and challenging especially for parents who are just starting out to bring their kids outdoors. Choosing a backpack or a daypack is very different from choosing a baby backpack carrier as you do not only consider your own comfort and safety but also that of your passenger.